I spent this past weekend in Seattle with my brother, Jason. He was in town presenting on Heidegger’s concepts of Vorhandenheit vs. Zuhandenheit at the national MLA conference (yes, that MLA). It went well and all, but as you can probably imagine, we needed a drink afterwards. We decided then and there that we’d better start our epic Northwest brewery tour as soon as possible, so we went out with a few of his rhetoric and communication buddies to Pike’s Brewing Company for lunch, had their IPA, then were off to Pyramid’s Alehouse (after a lovely cigar). We quickly discovered that this was not the actual Pyramid brewery, but just a brewpub, and that their actual brewery was in Portland (where I just drove up from that morning). After a wonderfully floral imperial IPA, we decided to walk the mile and a half back to our hotel. On the way back, we walked past an Elysian brewpub. How deliciously coincidental. We walked in and both decided to get the craziest thing on the menu. We saw it almost immediately: La Citrueille Celeste De Citracado. It was a collaboration brew between Elysian (Seattle), Rogue (Portland), and the Bruery (Orange County); and entirely West Coast beer. The description was so dense, it was overwhelming. 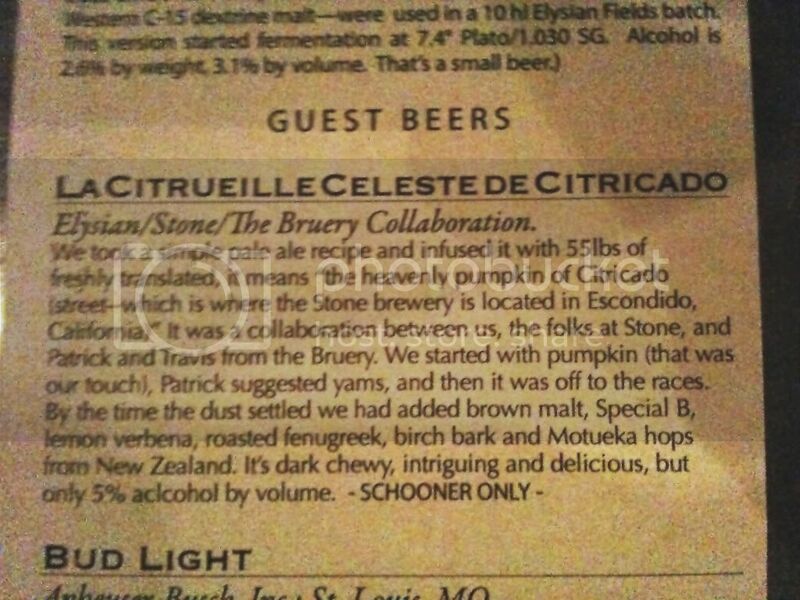 It was a beer with pumpkin, cilantro, fenugreek, and birch bark in it. We had no idea what to expect. When they brought it out to us in goblets (how else would one drink this beautiful invention? ), we did our best to enjoy every second of it. From the aroma to the mouthfeel and even the aftertaste, it was the most complex beer I’ve ever sipped. It was delightful. A few drinks in, as we were both raving about it, we both realized at the same time that there was no way we would order another one of these, much less even finish our current glasses (goblets). 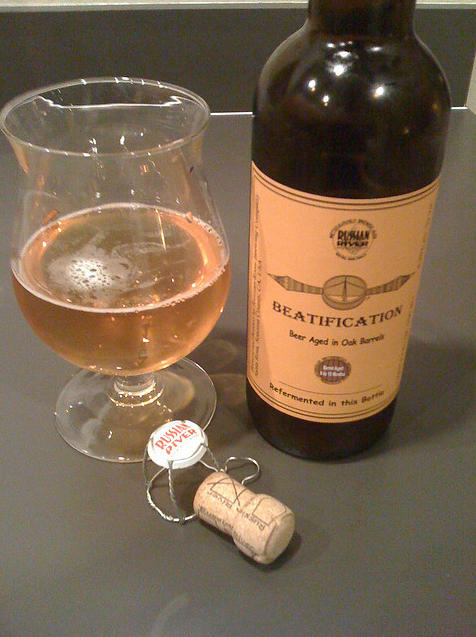 The beer was good, damn good, but it was so complex and hearty that it was sort of like eating steak and potatoes; not exactly a meal that can be repeated very often. We ended up at a McMenamins pub later that night and hung out with a friend of his, and the next day, we found the actual Elysian brewery, which ended up being within walking distance from our hotel. We had an amazing lunch there and then hit up a few bottleshops on our way back (okay…one was closed, and the other was Whole Foods—they do have a wonderful microbrew section though). We spent our evenings sharing in some of the best West Coast beer we could afford, watching football and reminiscing of old times, and dreaming of future successes and triumphs. It was a grand 36 hours. Now, I don’t want to say that this weekend wouldn’t have been possible without beer, far from it. But beer definitely enhanced our time together. And no, it wasn’t because we got so wasted that it lowered our inhibitions and we were able to connect on a seemingly deeper level due to the alcohol in our veins. In fact, we weren’t drunk at all, even a teensy little bit, throughout the entire weekend. The reason beer made the weekend better was that it was a middle ground for the two of us. Sure, we have our entire childhoods as middle ground, our faiths, families, and careers in higher education, but for some reason, beer and distilled spirits represents something different from all of those commonalities. Those other similar topics are parts of us; they’re naturally us, parts of our identities. Beer however, is optional, and—especially because we both homebrew—it’s a shared passion of ours. It’s something that we both take pride in when we make it and work incredibly hard at to make taste wonderful (or at least not too terrible). This also means that we do our research. We plan and read and listen to podcasts about how to make your homebrewing even better. We both put in (probably too much) work to make sure that we can be proud of the beer we produce. And a large part of making good beer, means simply knowing what good beer tastes like. (Not to say that I’m exceptionally good at this aspect at all, but I at least have knowledge and experience enough to know that the more types of beer I consume, the better I understand how to analyze them.) This is the research and development aspect of our operations, and it is certainly not a bore. It may sound like a joke, but it really does take a lot of beer drinking to figure out what is good and bad about the myriad of different aspects of the drink. Plus, we love telling each other about limited-run brews, messed up batches, or crazy seasonals that we’ve heard of—or even been blessed enough to drink. Knowing that I can bring up the differences taste in brettanomyces and lactobacillus yeast strains is a comforting thought, and while it may not be the deepest of conversations, it often leads to them. I think we started a conversation in the hotel room about Anchorage Brewing Company’s delectable Bitter Monk and how bitters and sours are getting tastier and tastier and ended up in a jacuzzi talking about different books we’ve read that have made our marriages better. I’m sure there were a few steps in there that led to that other than just beer, but I’m fairly sure it started there. All in all, it was a great weekend full of good food, great beer and fantastic conversations with my big brother. Thanks, Jason. Can’t wait till our next weekend together. I have no idea when that will be, but I’m sure it’ll be full of delicious brew. 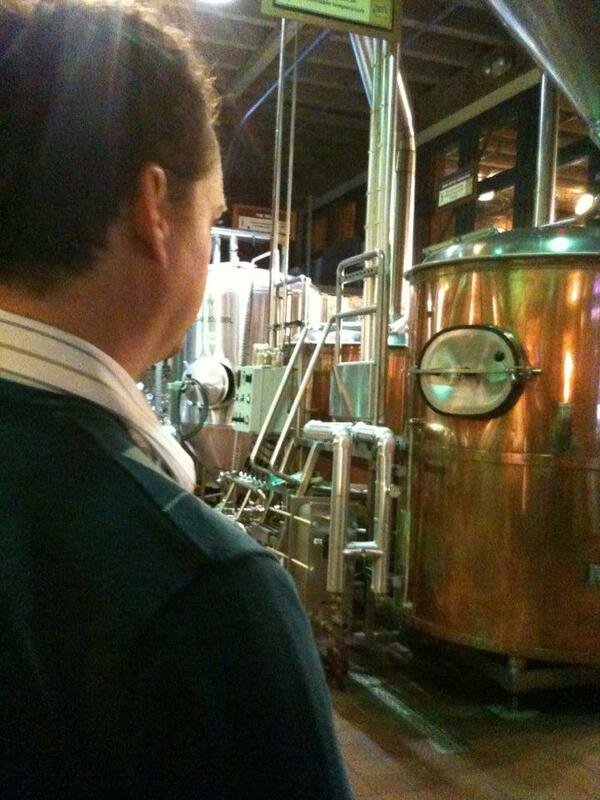 This entry was posted in Blog, Life Musings, Writings and tagged beer, Jason Helms, Portland, Seattle.